This course will tell you about hot-mix asphalt often used for high-performance pavements. The degree of performance required should be selected based on traffic conditions and the availability of satisfactory materials. 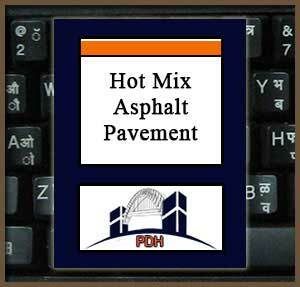 Hot-mix asphalt mixtures consist of mineral aggregate and asphalt cement. These hot-mix asphalt mixtures are particularly suitable for airfield pavements, roads and streets, and storage areas. Learn how the Penetration Viscosity Number (PVN) is determined and used in hot mix pavement design. This course is intended for civil engineers and other design and construction professionals wanting an introduction to hot mix asphalt pavement design. This is an introduction to the methods and materials employed in hot mix asphalt pavement design and construction. After completion of this course you will be prepared to advance to design of real projects using hot mix asphalt pavements.